You are invited to ride with us in the Summer Solstice Ride in Whistler! Are you a road cyclist and available for a classic ride on Saturday June 20th? 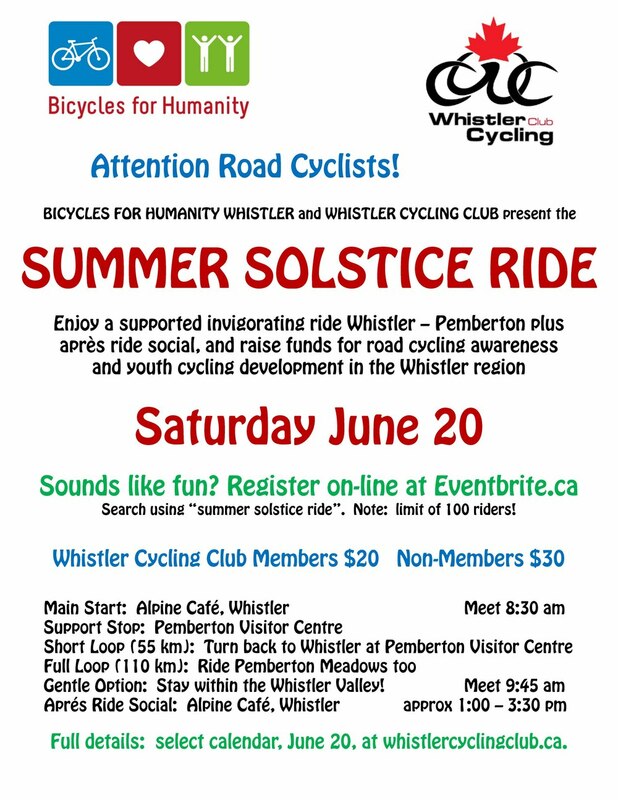 The Whistler chapter of Bicycles For Humanity and the Whistler Cycling Club have combined forces to promote and host this year’s Summer Solstice Ride. Historically this ride draws riders from the lower mainland and Sea to Sky corridor to a great ride and raises funds to support the shipping of donated bicycles to needy communities in Africa. This year proceeds from the event will be directed to Cycling BC’s iRide program for youth cycling development in the Whistler area. Nurturing an awareness and attraction to riding in members of our community serves the missions of both non-profit groups, and leverages Cycling BC’s iRide program for youth cycling development. The Hwy99/Meadows Route. The Summer Solstice Ride heads northward from Whistler, with two distance options. The full ride is 110 km, with an option to ride 55 km. Riders should be self-sufficient and comfortable riding on highway shoulders, and come equipped with sufficient food and clothing. There will be vehicle support with juices and snacks at the Pemberton Visitor Centre, approximately 27 km from the start/finish, which allows riders to have their own food/nutrition and clothing carried by the vehicle. The Valley Only Route. Would you like to participate, but feel that riding a highway sounds too onerous? We still want you! Your group will stay within the Whistler valley area, accompanied by a trained Whistler Cycling Club ride leader, with route and rest stops attuned to the interests of the riders. Please register by June 19, at Eventbrite.ca. Your advance registration will help us plan accordingly. And if you aren’t yet a member of the Whistler Cycling Club, consider joining our club.